Most college students these days get some sort of internship or practical work experience before they graduate. Large businesses, news and radio stations, and professional sports teams seem to be among the most desirable places to work. So why not have a role in all three fields? Look no further, interns. LeBron James has solved all your job search problems. The four-time NBA Most Valuable Player is currently seeking student interns for his personal and professional marketing initiatives. James is looking for students to “maintain basketball and technology industry dossiers” and “communicate and interact with LeBron fans around the world”, among other things. It sounds like an ideal situation: work with social media tools and blogs with one of the best basketball players of all time. After all, students DO want to learn from the best in the business, so to speak. But the concept of an internship with “King James”, idealistic as it may be, should prove to be a very difficult job to get. First of all, thousands of people will likely apply to work for a high-profile athlete like LeBron James. And there are also many qualifications required of candidate interns. Only collegiate students can apply, and they need to be proficient in certain software program codes like CSS. James is also requesting that his interns live in New York, Miami, or Ohio, that they study marketing or communications, and that they have fluency in Spanish. But the idea itself is still revolutionary. With so many colleges and universities encouraging students to gain practical work experience during their undergraduate years, the need for more internships is growing. The growth of social media outlets like Facebook and Twitter is also growing, and who better to work on these websites than young adults with social media experience. Perhaps LeBron James’ example will convince other star athletes to hire interns as well. 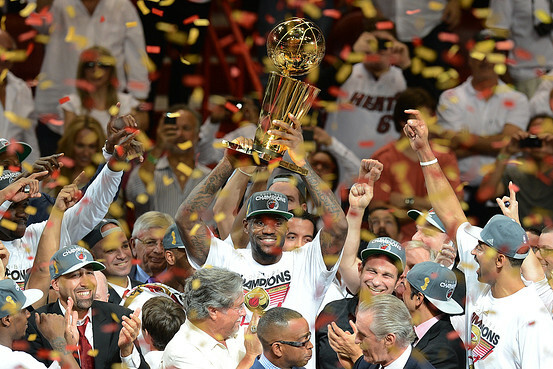 Like him or hate him, you have to hand it to LeBron James for the creative idea. 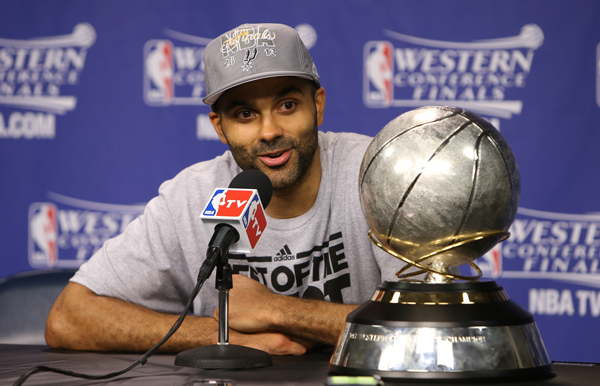 Tony Parker addresses the media with the Western Conference Championship trophy. When you think about powerhouse teams in the NBA, you think of the Miami Heat with the Big Three, the Los Angeles Lakers with Kobe, and the Boston Celtics with their own Big Three. But one team that always seems to slip through the cracks is the San Antonio Spurs. Despite their lack of an outspoken, Twitter-savvy superstar, the Spurs have gained a reputation as one of the best teams in the NBA in the 21st century. Case in point, the 2013 Western Conference Finals. The second-seeded Spurs swept the fifth-seeded Memphis Grizzlies in four games to earn their fifth ticket to the NBA Finals since 1997. Tony Parker led the Spurs with most of the scoring (he had 26 points in Game 3 and 37 in Game 4), and Tim Duncan continued to prove his skill in the low post, averaging nine rebounds per game. The Spurs now await the winner of the Eastern Conference Finals between the Miami Heat and the Indiana Pacers (Miami leads 2-1). The Spurs are getting the job done offensively, averaging 101.6 points per game this postseason and shooting 47% from the field. The Spurs even boast their own Big Three of sorts: point guard Tony Parker is averaging 23 points and 7.2 assists per game this postseason, shooting guard Manu Ginobili scores 13 points per game, and power forward Tim Duncan has 17.8 points and 9.2 rebounds per contest in the playoffs. Parker, Ginobili, and Duncan certainly don’t play the most up-tempo, exciting style of basketball (a la Miami with LeBron James and Dwayne Wade), but their effective style of play has led to the most important statistic: Wins. The Spurs previously won NBA Championships in 1997, 1999, 2003, and 2007 under head coach Gregg Popovich. But the Spurs haven’t been on the NBA’s biggest stage in six years. Said Tim Duncan, “We want to get back [to the Finals]. We’ve had some really close years where we fell right on the verge of getting back. It feels like forever since we’ve been there.” Duncan led the Spurs during all four previous trips to the NBA Finals, and won three Finals MVP awards in ’97, ’99, and ’03. But Tony Parker might be the best player on this 2013 team. “He’s been amazing,” Duncan said of Parker. “Every year he gets better and better and better.” Not bad praise from one of the best players in NBA history. The Spurs are dangerous opponents for many reasons. They bring years of veteran leadership and playoff experience to the table, and boast one of the most dominant and skillful trios in NBA history. Gregg Popovich is one of the most consistent coaches in NBA history, winning 68% of games in his 16-year coaching career. And the Spurs have NEVER LOST an NBA Finals, winning in each of their four appearances. It will be a tough road for Miami and Indiana to travel to win the NBA Championship, especially through San Antonio.